2010 was a tremendous year of growth for the Regional Network. Across the world, Regional leaders are engaging with local populations through a broad range of civic, social, and artistic projects, continually increasing Burning Man’s profile as a year-round cultural community. Through individual efforts and collaboration with other Burner communities, civic arts councils, and cultural outreach groups like Burners Without Borders, Black Rock Solar, and the Black Rock Arts Foundation, Burners are having a positive impact all over the world, continually illustrating that Burning Man is so much more than just a week in the Nevada desert. This year, the worldwide network of Regional Contacts expanded to welcome 27 new representatives – accommodating not only turnover in existing regions, but adding new locations around the world, including the Philippines; Perth, Sydney and Melbourne Australia; and new domestic outposts in Bellingham, Washington and Nebraska. Interest in the Regional Contact role is consistently high, and we’ve heard from Burners in places like Bahrain, Israel, Denmark and Singapore who are already organizing meet-and-greets, newbie orientations, and other participatory events in pursuit of nurturing local Burning Man community. Because of the importance of these local leadership roles and the complexity of the network overall, we are purposefully deliberate about the process of installing and supporting brand-new regions; still, it’s important that the wait time for the protracted vetting and interview process does not stall the momentum of nascent communities, so the Burning Man Regionals Committee has encouraged mentorship through the pairing of these emerging community leaders with seasoned Regional Contacts and Regional Contact alumni. 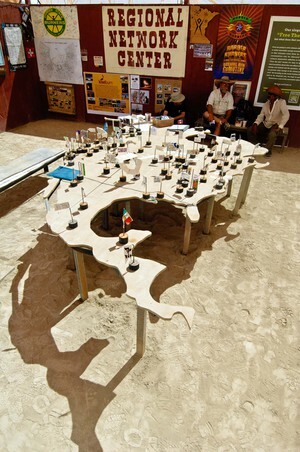 At the 2010 Regional Network Celebration on playa, the Burning Man Project announced it had invited 12 regional leaders, representing various geographic areas and ranges of expertise, to form a new committee supporting the leadership and governance of Burning Man’s worldwide regional network. Comprised of top-notch, experienced Regional leaders from across the world, the Meta-Regional Committee will serve as a source of support and development for the entire Regional Network. The first committee meeting took place in November, 2010 and the members are working to craft a mission and vision statement that will shape the future of this leadership body and how it will work with the Burning Man Project to nurture and enhance our community’s cultural presence around the world. In March 2010, we welcomed over 100 Regional Contacts and invited Burning Man community leaders to San Francisco for the 4th Annual Regional Network Leadership Summit. The official schedule included workshops on art grants programs, volunteer management, meeting facilitation, succession planning, intellectual property, technology, participatory culture, and more – and, in keeping with the trend at any good conference, participants conducted intense informal networking in the halls between sessions. On Friday of the Summit, we invited 46 different cultural collaborators — from Bay Area non-profit groups, arts collectives as well as several Burning Man departments and offshoot organizations — to participate in the first ever “Conventional Caucus,” a tradeshow-style event where groups could set up tables and interact with conference attendees. Designed to provide a forum for groups, staff, and Regional leaders to exchange ideas and expertise, the Friday Caucus more than succeeded as a platform for new collaborations. The intensely energetic afternoon was capped off by an inspiring evening address by Burning Man’s Director, Larry Harvey. Summit attendees returned home armed with tools and information to support them in their leadership roles as well as new relationships and opportunities for future collaboration. 2010 saw an increase in collaboration between Burning Man regional communities and Burners Without Borders, Black Rock Solar, and the Black Rock Arts Foundation. Burners from Vancouver to New England participated in the 4th Annual BWB Cinco de Playa Beach Cleanup; BWB Detroit created hundreds of care packages and distributed them to the homeless. Burners in Reno, NV rallied around the Black Rock Arts Foundation’s installation of Kate Raudenbush’s Duel Nature on the waterfront of the Truckee River. Black Rock Solar partnered with the Sunpower Foundation and Poetic Kinetics Inc. to create two solar powered, kinetic sunflowers, which will exhibit for the purpose of educating the public about renewable energy. Regional groups across the U.S. will be partnering with Black Rock Solar to bring the sunflowers to their communities. On playa, the Regional Network joined forces with these outreach groups to create “District Everywhere,” a place where Burning Man participants could learn more about the missions of these partner organizations and learn more about how to get involved. And, of course Burners never run out of reasons to celebrate in style. 2010 saw hundreds of Burning Man-related or inspired events all around the network, from official weekend campouts to informal gatherings, volunteer/civic projects to “prepare for the playa” workshops. 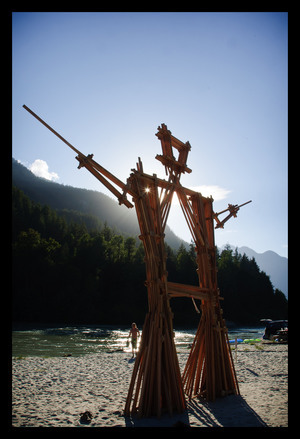 New in 2010 was the first ever Italian Burning Weekend in Alviano, Italy and the OzBurn Seed Gathering in Bellingen, New South Wales in Australia, and as always, there were dozens of official Decompression events and Precompression parties. Embodying the 10 Principles of Burning Man, these are Leave No Trace events and are designed to involve and benefit the entire community. The Film Fest in a Box (FFIAB) program is a plug-and-play film fest for Regional Contacts to bring local Burners together and share the experience of Burning Man on the big screen. The program saw new enhancements in 2010 with the creation of a FFIAB website for digital film downloads (eliminating the need to mail DVD packages to exhibiting regional organizers), and other enhanced support. Regional groups from San Diego to Paris held these Burning Man Film Festivals as part of the FFIAB program. Many groups have chosen to combine the film festival with other activities such as fire spinning, clothing drives, art shows, workshops, or clothing swaps. We are inspired to see Regional groups utilizing the FFIAB as a way to fundraise for their local community, to gather people together, and to showcase the work of Burning Man filmmakers that might otherwise never be seen in the theater. There are now more than 200 Regional Contacts in the Burning Man Regional Network, serving communities that span 17 countries and five continents. We look forward to seeing the Regional Network continue to flourish and evolve in 2011.